The Geneva Community Compact, a police-led effort to improve relations between the Geneva Police Department and the community, is not an effort to increase police accountability. The group is not transparent and refuses to allow the public to participate in their taxpayer-funded forums, instead hand-selecting participants who will not openly criticize the police or address public calls for accountability. Sadly, city officials and others continue to hold up the Compact as evidence that something is being done about police misconduct, giving the impression that the issue is “being handled” and there’s nothing else residents can do. The Compact makes costly recommendations to city council, and city council has approved 100% of those recommendations to date. Recent reports say that one or more city councilors will soon propose a valueless “review board” to receive complaints of police misconduct. This new “review board” (or mediation program) would be modeled after other weak and ineffective “civilian review” processes being used in the cities of Rochester and Schenectady, NY. As always, residents are allowed to attend monthly Community Compact meetings but are not allowed to speak, and the dates and locations of the meetings are not publicly announced. The Compact is no longer hosting policing forums that are open to the public, so the only way for citizens to obtain any updates on the work of the Compact is either to attend the monthly meetings or to review the Compact meeting minutes when they are posted on the city’s website. The minutes from the December 2018, January 2019 and February 2019 Compact meetings are available, and reveal that the Compact Committee is continuing to push programs that will have no effect on issues of police misconduct, and instead will serve as public relations tools to shield the police from scrutiny. It’s apparent that the Chief of Police is still calling the shots for the Compact, the complaint process is still broken and won’t be fixed, the Compact is wholly unaccountable to the residents of this city, and the people of Geneva still need a real citizen oversight board to hold the police accountable. (City Councilor At-Large Mark) Gramling also reported at the December 2018 council meeting that the Compact had consulted with individuals from two ineffective and harmful “civilian review boards” currently operating in upstate New York: Cheryl Hayward, from the Center for Dispute Settlement and Rochester Civilian Review Board, and Lieutenant Tom Kelly, from the Schenectady Civilian Police Review Board. Both of these “review boards” have been heavily criticized in their respective communities, and are clear cases of how to enable a “review board” that has no power to improve policing and exists solely to give the public the impression that something is being done to address police misconduct. At the February 2019 Compact meeting, Gramling updated the committee about his recent discussions with Lt. Kelly in Schenectady about their civilian review board. Gramling reported that the Schenectady review board consists of ten members, including representatives from the local newspaper, the Chamber of Commerce, and the city’s housing authority. After mentioning that using a “mediation process” was also an option, and that funding would be needed for both options, Gramling revealed that “he spoke to some of the council members and they are for it.” Sources have said that at least one other councilor has spoken to constituents about proposing “review board” during the 2019 election season. Is Councilor Gramling (with the support of other members of council) preparing to recommend this kind of “civilian review board” to city council during the final months of his council term – one that has zero authority to hold police accountable for misconduct, inexplicably includes members from the local newspaper and chamber of commerce, has never asked the community if they think the board is working, and doesn’t even review the most serious allegations against police? Mallard’s “professional experience” would apparently be her employment as a drug treatment court resource coordinator at Canandaigua City Court. Her employment within the Ontario County justice system would appear to present a serious conflict of interest with her role as NAACP president in situations where residents may ask for her help with incidents of alleged police misconduct. In addition, Mallard seems to be implying that transparency for a review board would require publicly releasing the names of those who have filed complaints. This is grossly misleading, as the data and findings of a review board could certainly be made public while still preserving the privacy of complainants who don’t want their names released. In any case, why is the president of the local NAACP arguing against police transparency and accountability? The Compact Committee committed a cringe-worthy public relations blunder when they appointed volunteer “Complaint Resource Assistants” to help citizens “navigate the complaint process” in February 2018. 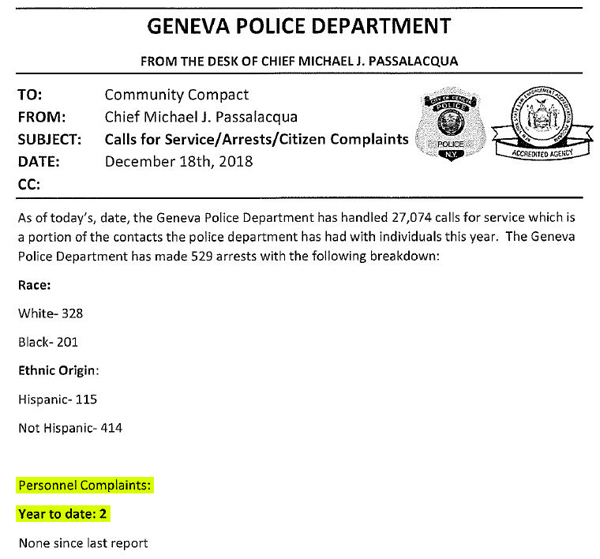 According to a letter attached to the December 2018 Compact Meeting Minutes, Geneva Police Chief Mike Passalacqua reported that there were a total of just 2 complaints filed against Geneva Police Department personnel in 2018. This small number is extremely deceptive because of the way many complaints are routinely handled by the police department. When a resident goes to the police department to file a complaint against an officer or officers, they are often offered a personal meeting with Chief Passalacqua. Many residents will feel like they are being treated with dignity and respect, and that they will be able to find justice, by speaking directly with the head of the police department. But no matter what happens after meeting with the chief, that person’s complaint will not be recorded as an official “personnel complaint” unless an actual complaint form has been filled out. In 2018 alone, sources told Geneva Believer of at least three cases of residents whose complaints were addressed in personal meetings with the chief. In all of these cases, the resident did not fill out a complaint form. In all of these cases, accusations of misconduct, including excessive force, were made. It’s entirely possible, even likely, that there were even more cases of complainants being sent directly to a meeting with the chief, rather than first being given a complaint form to complete, in 2018. Yet the public is led to believe that there were only two occasions during all of 2018 when a police officer might have stepped far enough out of line to warrant a complaint. In addition, some residents have reported that when they have requested and received an official complaint form at the police department, the officer on duty has reminded them that they could be convicted of a misdemeanor if it is found that they have been untruthful on the complaint form. This type of warning from a uniformed officer could strongly discourage citizens from filing an official complaint, due to possible fear of being wrongly convicted of lying on a police report if the officer denies the claims. You can not be convicted of making a false written statement unless you make claims that you know to be false. It is critical that all residents with complaints fill out the form so that their complaint will show up in the complaint statistics released to the public. 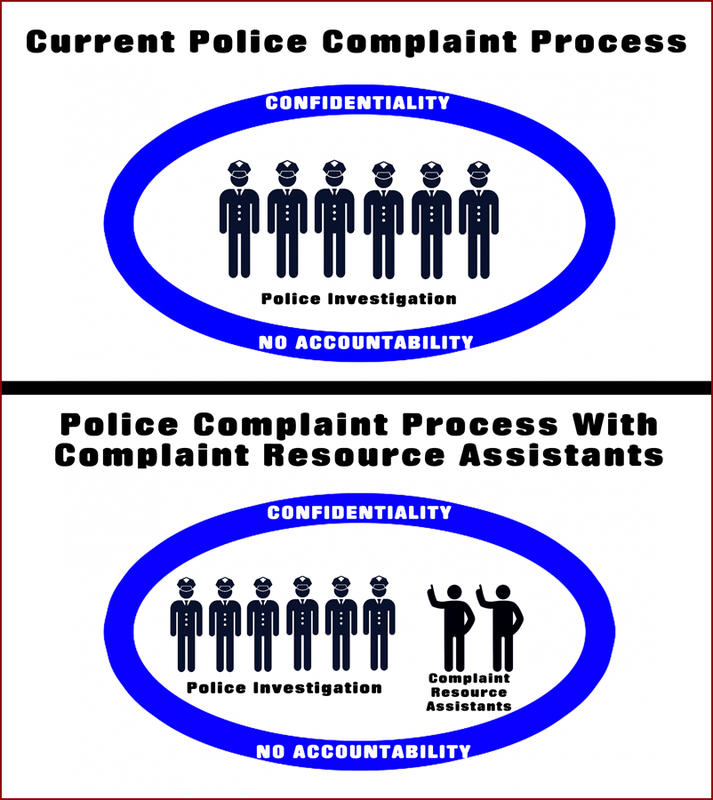 Asking someone from the city (or one of the “Complaint Resource Assistants”) to help you with the form is not recommended, as the city and police department have made it clear that they are not concerned with transparency and justice and will not be on your side. If you need help filling out a complaint, contact Geneva Believer and you will be put in touch with someone who will assist you and advocate for you. Chief Passalacqua has openly refused to honor the community’s decades-long calls for civilian oversight of the police in Geneva, stating his opinion such accountability measures are not needed. And at an October 2018 public forum hosted by the police-led Community Compact, Passalacqua would not agree to allowing a civil rights expert to review the body-worn camera policy that was under development. At the January 2019 Compact Meeting, Chief Passalacqua once again refused to agree to allow a civil rights attorney to review the draft body-worn camera policy. Why is Passalacqua opposed to having a civil rights expert review the policy? Wouldn’t he want to be certain that the policy is as transparent and fair as possible? A policy that favors the police can make body-worn cameras far less effective at holding officers accountable. It is the most important piece of any body camera program, and the Compact is working hard to make sure the public has no idea what’s in the policy and that nobody other than city attorneys, police attorneys and officials, and Compact members are able to view the policy before it is finalized (if it hasn’t been finalized already). “A lot of folks, they may not know fully that there is a complaint form. Folks have called me, and I think I’ve expressed this before, they don’t realize there’s an actual form. In short, the problem isn’t with the police, it’s that the people just don’t get it. In the February 2019 Compact Committee minutes, Gramling is joined by Mallard to argue that when it comes to holding police accountable, the people just don’t get it. Residents have been repeatedly told that if they ask for police accountability, they are being “confrontational” and they will be responsible for ending the compact if they keep talking about it. Residents have been repeatedly told that if they ask for police accountability, they are simply not “educated” about the subject and should trust the police-led Compact to “educate” them. Residents who ask for police accountability at Community Compact policing discussions are no longer allowed to participate in any Community Compact policing discussions. Residents asked that former Chief Jeff Trickler be held accountable for failing to fulfill the residency requirement in his contract, and several Compact Committee members spoke out in favor of City Council giving Trickler an exemption and he suffered no consequences for his actions. Residents were told by the Compact that an internal investigation into a Geneva Police officer who posted racist memes online had begun, and more than a year and a half later, the Compact has not issued any public updates. Residents who asked for a Police Accountability Board with disciplinary and investigative power after it was recommended by a policing expert hired by the Compact were told that they were “naysayers” who only wanted to complain about problems. Meanwhile, on January 14, 2019 in Rochester, NY, the Rochester City Council released a proposal for a police accountability board that, when it is instituted, will be the most transparent and citizen-powered police review board in the United States. In Geneva, the police department controls the narrative around police misconduct because they control the Community Compact. The Compact has been given a chance for eight years, and they have failed.